Nectar offers an apiary management platform to assist beekeepers in keeping their honeybees thriving, using sensors and AI. Honeybees are a pillar of our food chain – over a third of the food we eat depends on them. Nectar will help beekeepers grow thriving honey bee colonies to answer the rising demand in pollination services. 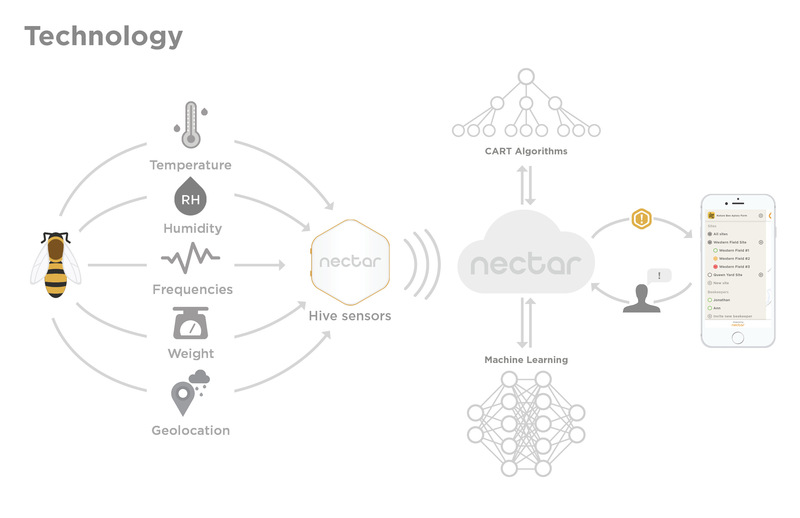 Nectar is a technology company that is seeking to bring tracking, data, analytics, and connectivity to the beekeeping industry. It is tackling the status quo method of apiary management whereby beekeepers must physically visit each hive to individually inspect the presence and severity of hive health issues. Beyond being time intensive and costly, the traditional methods have been struggling in the face of mounting new threats to bee survival each year. These include pesticides, pests and diseases, which have caused their survival environment to become increasingly delicate. This has resulted in a colony loss rate of 40% per year on average, globally. Helping beekeepers keep more productive colonies while reducing their operating costs. 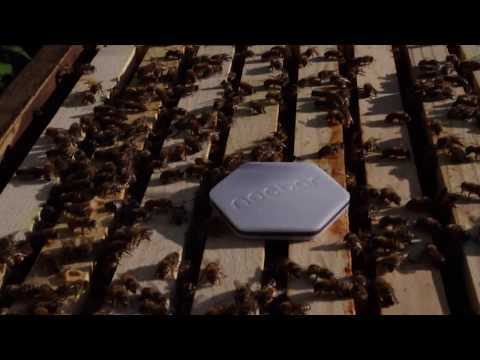 Nectar devices track the hives constantly and in real-time in terms of geo-location, weight, temperature, humidity, and acoustic frequencies, which are then sent to the cloud (powered by Microsoft Azure and Google Cloud). Beekeepers track and monitor each hive through the Nectar platform app, which run on machine learning data-processing software to analyze the input data received from the hives. The Nectar platform gives the beekeepers actionable insights on how to interpret the data, and these insights are moderated depending on the size of the operation and area of business activity (honey production, pollination services, or bee sales). Nearly one third of our food is directly dependent on bee pollination, while over 75% is indirectly dependent on bees and other pollinators. With rising annual colony losses, commercial beekeepers can’t keep up with the growing demand for pollination services provided by domesticated honey bees. Nectar’s activities will contribute to the survival of bees and help secure our food bank. The contribution honeybee pollination brings to fruit, vegetable, seed and nut production is now estimated at more than US$200B. Dependency on honey bee pollination has grown 50% between 1996 and 2006. The high loss rate and mounting operating costs in the beekeeping industry weaken the supply chain for many crops and put our food security in jeopardy. Nectar's main competition is indirect: the status quo. Most commercial beekeeping operations have been in business for several years, some for several decades. Beekeepers have been using and improving their own methods and habits since they rst started. Even if these habits are hardly enough to face the challenges of beekeeping, convincing beekeepers to adapt them could prove di cult. The products (devices and platform) have been designed to be incorporated into current practices and to improve upon them rather than requiring consumers to completely change their behaviour. Nectar has created a chart to calculate the economic impact of its solution in order to show beekeepers the product’s full economic potential. Nectar’s direct competition is composed of a fragmented and not well-organized group of small companies which are struggling to break into the market due to customers’ price sensitivity and culture change resistance. The majority try to penetrate the market with solutions not well adapted to the market place needs. Nectar sets itself apart from the competition by offering automated analysis (based on artificial intelligence) and quality data interpretation via an intuitive and user-friendly interface. 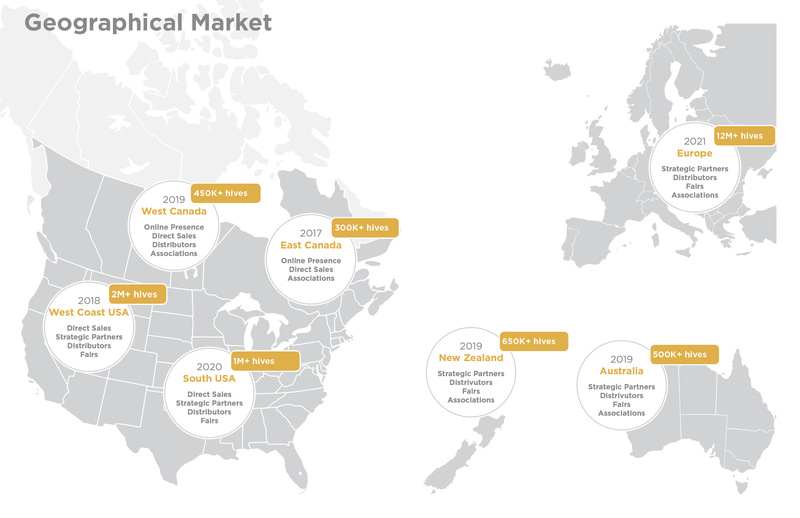 Nectar has first-mover advantage with many of the well-known commercial beekeeping operations in Quebec, which has been greatly beneficial for follow-on sales and general network leverage. Nectar has completed five successful pilot programs and is launching into its commercialization phase. Nectar made its initial sales in Fall of 2016 with successful beta programs of its MVP. Last year, the company launched its second commercialization phase with five pilot programs in partnership with commercial beekeeping operations in Quebec, which has a combined total of 10,000 hives in operation (100 in pilot programs). During these programs, Nectar was able to identify and save five hives which otherwise would have perished! Each hive costs the beekeeper around $1,000 to replace, and has provided a concrete value proposition in further lead discussions. Nectar is currently pre-selling for the remainder of FY18 for delivery at the beginning of the 2019 season, when it plans to be fully commercial.. Sample customers Nectar has worked with. Number of queen deaths averted. Per hive economic cost savings to beekeepers, including labour and time. This investment is illiquid given the stage of the venture. A liquidity event is unlikely to take place before the proposed exit as outlined by the Company. Investors should not expect to access their principal before an exit, which may not take place for five (5) to ten (10) years. The planned business operations and revenues for the next phase of business at Nectar is dependent on customers adopting the product as well as for the Company to find the right commercial package formula related to the price, the features and support required to scale sales in large volume per customer. After completing with success its Beta phase with 5 customers and 100 hives, Nectar his launching its first commercial sale campaign with the goal to reach 10,000 connected hive. Although most technological risk is behind, the Company needs to industrialize its manufacturing process and perform cost reduction programs. Additional features related to the platform and sensor as well as for the data pipeline collection needs to be developed, implemented and released in the next versions. Beekeepers are conservative in nature and could prove to be resistant to adopt easily new technologies that forces them to change the way they operate. This could have a negative effect on speed of customers adoption rate. More research and performance data could be necessary to scale faster its customer base in the short-term. The Company will have to conduct further validation to confirm if its commercialization strategy needs to be adapted for each geographical market. This could result into a higher investment cost to support sales and marketing efforts. Nectar is an early-stage company with limited underlying assets to secure or de-risk this investment opportunity. All of the capital invested in the company via this offering is at risk for loss. 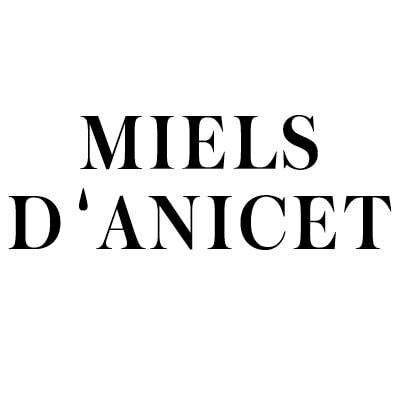 The company has a limited history of revenues generation and track record to meet their debt financing obligations by making the requisite interest payments. This type of investment has substantial risk. Investors should make an investment only if you are prepared not to receive any return on your investment and to lose your investment in its entirety. Nectar intellectual property protection strategy is currently being developed with a legal and patent firm. The innovation comes from the assembling of all the platform technology pieces. No patent has been granted as of today and there is a probability that the Company IP protection strategy may not create any value. SAFE investment products carry certain risks. The investor is not receiving equity, only a future opportunity to do so and that the opportunity to receive equity in the future is contingent upon Nectar achieving certain milestones. Marc-André has worked in product design and commercialization from 2013 to 2016. As a volunteer beekeeper for Beekeeping Collective at Santropol Roulant, a non-profit that keeps beehives in Montreal, he took on bee-related design projects. He also took part in Google’s 30 Weeks training program for entrepreneurs in New York City. Xavier de Briey is in charge of technology development at Nectar. He studied electrical engineering in France and at ÉTS (tech and engineering university) in Montreal, and interned at Thalès and Hydro Québec in aeronautical-electrical engineering. His background makes him the perfect choice to take the helm in Nectar’s product development. Evan Henry completes the management team as the Lead Apiary Scientist and manager of Nectar’s software. Henry received a Master’s in Agricultural Engineering from McGill University, where he presided over the McGill Apicultural Society. He then went on to work for the NASA DEVELOP program implementing deep learning IT systems for drought prediction.